1 . All direction measurements are instantly recorded on the map. The intervening processes of recording field notes and plotting them are eliminated. 2. The map is constructed at once, in the field, so that no permanent records are necessary other than the map itself. 3. The topographer sees the ground that he is mapping. He can draw a more perfect representation of the ground and yet use fewer field observations. In cooperation with the U.S. Geological Survey, K&E has developed the K&E Paragon® Self-Indexing Alidades." Alidades were the primary mapping instrument in the U.S. from about 1865 to the 1980s. They were replaced by the total station. Transits and/or theodolites were used to establish boundaries and to locate key points but the plane table and Alidade was used to fill in the detail on a map. 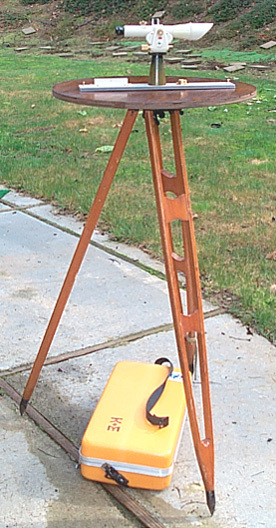 The surveying alidade is used on a table whose surface is level (plane). This is a requirement so that lines of bearing are correct. Very early alidades might have been as simple as a straight stick with raised sights similar to those on a rifle. No optical parts would be involved. With this you could draw a line of bearing on a map. Determining true or magnetic North and the distance to any target would need to be done using other means. In my opinion this instrument is one of those made at the peak of alidade development. Instead of using a vernier scale to read vertical angles this instrument uses optical scales similar to those on a Theodolite but with enhancements to aid in its use. Distance is determined using the method of stadia. In this method the distance to the target is the stadia intercept on the rod times 100 feet if the sight is level. As the angle to the rod deviates from level the distance measured in a horizontal plane (the way maps are made) decreases by the cosine squared of the deviation angle, alpha. There is a damped pendulum that is operational when the bubble in the circular level is within the outer circle. It compensates for the base of the alidade being out of level so that vertical angle measurements are accurate even when the base of the alidade is slightly out of level. This is a good thing because the table does need to be perfectly leveled. Because of this it's important the the base of the alidade is not tilted between the time the sight is taken and when the optical scales are read. If for example the table is tilted slightly after the sight, even though the alidade is not disturbed, the reading will have an error due to the self leveling. There are three scales that are read optically, two of which do the trig calculations so only a single multiplication is needed to find the horizontal and vertical distances from the center of the instrument to the centerline reading on the rod. The brochure calls the above method Stadia arc method. It is not clear if there is a 1 foot adder for close distances, like on a typical transit. There appear to be two versions of most manufacturers Alidades. The tall version, like this one, that comes in a rather large case, like would be convenient to carry in a car. The short version that would be packaged in a very small case designed to be carried by someone in the field. 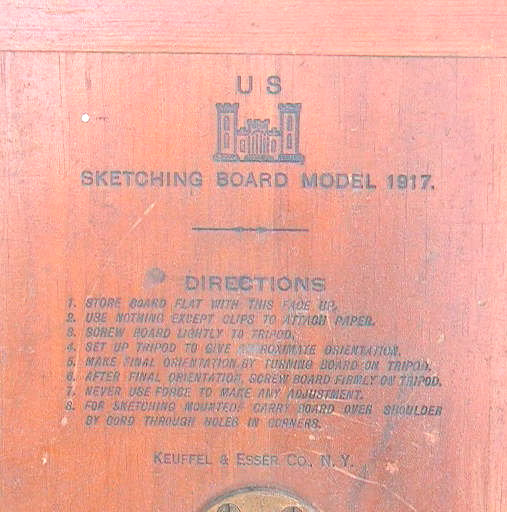 K&E refers to the smaller version as the "Expedition". The 1949 model N5095A Expedition Alidade weighs 5 lbs whereas the N5093A Geological Survey Alidade weighs 7 lbs. This booklet mentiones that for "internal focusing" instruments the C=1 foot factor has become negligable so the distance is just 100 * the stadia intercept. Older external focusing instruments use Dist. = 100 * S + 1 (all in feet). In the 41st Edition of the K&E catalog (1949) there is a description of "internal focusing" and it's benefit that it keeps the inside clean. An external focusing instrument creates a vacuum when the objective is extended, sucking in dust. Other 76 0000 Alidade were made for the U.S. government with NSN 6675-00-756-1836 on contract DAAJ09-80-C-5015. I got this tripod separately on eBay. The head has a dual function in that when the upper wing nut is loosened the head and be adjusted for level. Once that is done and the upper wing nut is locked the lower wing nut can be loosened, allowing the table to rotate but not tilt. The head has a male 5/8 - 18 thread to mate with the table NOT the standard 5/8-11 surveying tripod thread (WHY?). By having my local Babe's muffler shop weld a 5/8-18 nut to a 4.75" square electrical cover plate and inlaying this into a piece of plywood, I made my own table that attaches to the tripod. A 2 foot diameter table holds a "B" size drawing with room for other stuff. There appear to be Models 1913 and 1917. These probably refer to years since part of the instructions on the back of the 1917 Model has to do with how to carry the board on horse back. Also the 1917 Set included three seperate collapsible legs and an attaching disk so the board could be used without a tripod. At the first office supply store I tried clerk had a blank look on his face when I asked about "B" size paper. I tried another office supply and said I wanted 11 x 17" paper and they said "Oh, Ledger paper" and gave me a couple of sheets from their copy machine. Getting Mylar "B" size drafting paper will require a trip to a specialized store. Page created 2 Jan 2003.